With a slick new website, the Foundation or Biomedical Research (FBR) has made it easier than ever to access accurate scientific information on their website. FBR has worked for over 30 years to educate the public about the importance of science and animal research in efforts to improve the health of animals and humans alike; their new website represents another step along that path. The new website layout provides easy access to information emphasizing the role of animals in scientific discoveries, such as the animal research behind the 25 most frequently prescribed drugs treating human diseases. The media center provides press releases and videos about the need for animals in research, including a press release about the public support for using non-human primates to develop an Ebola vaccine during the epidemic this past year. 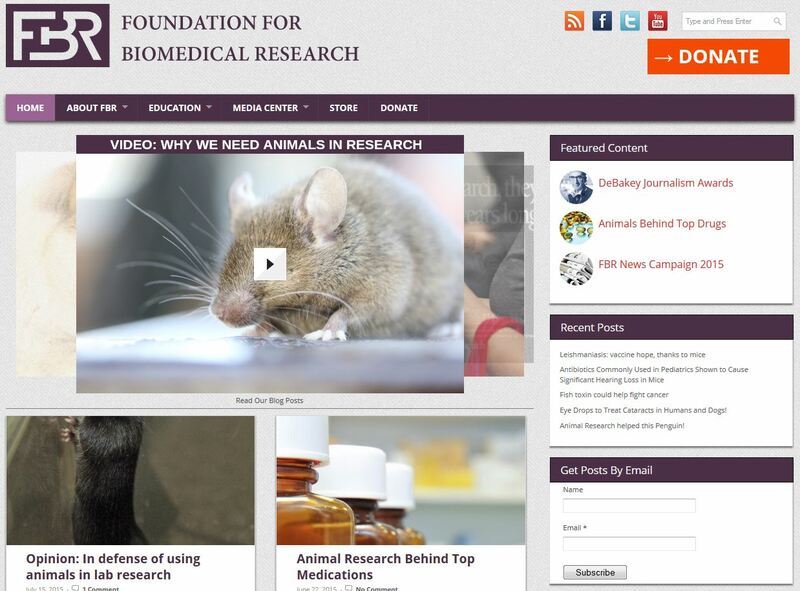 The page footer features other organizations that promote animal research, (including Speaking of Research!) and links to fact sheets, including those highlighting research using rodent models and non-human primates. With links to blog posts, education materials, and the @researchsaves twitter feed, FBR has provided their audience with easy access to information on the benefits of animal research. Great job! Next Next post: Cotton Rats, Calves and Clinical Trials: New RSV vaccine shows great promise.